and the crew came to attention. he can push everyone around. and he would, in fact, push everyone around. right out the door, with his great reindeer herding instincts. they were going on his LIST! Do ya think they're distracted enough for me to eat this hat? OMG!!! That is the cutest thing ever!!!! Awwwwwww just too cute! How did you get them to keep the hats on? So cute! 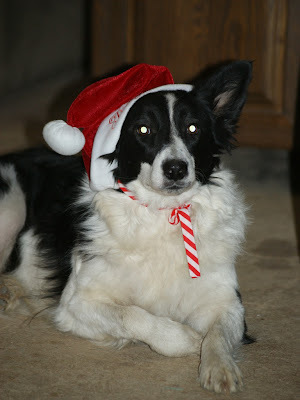 I have never had a dog that would have kept a hat on long enough to take photos! I love their costumes it's adorable. Lol! Misty... this is the cutest post ever! Thanks for putting a HUGE smile on my face this morning! All dressed up and no Santa to take the out. Aw, poor babies! How do we get them off of "the list"? LOL, what our pets will put up with for the people they love. Great shots. Awe! that's sooo cute and beautiful. I wish mine would keep hats on, but they wrestle with them until they are off!! Well that's just too cute and festive. They certainly gave you their undivided attention!! Great photos..so attentive, hard to get these kinds of photos, esp when there are three of them. Great job, Misty! 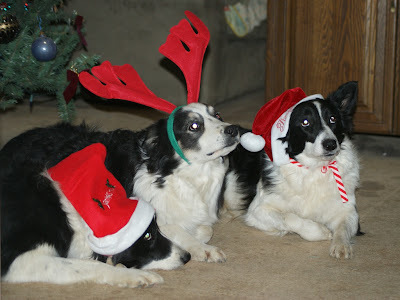 They look adorable - my pups (Gunner anyway) wouldn't sit still for those! They're so cute! and my favorite colors - black and white with red. Oh, that's too cute! 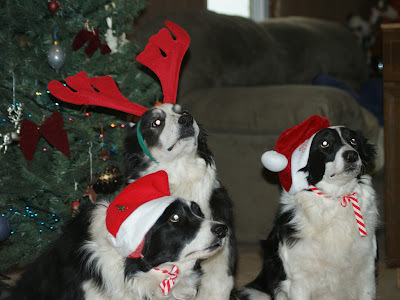 I'm so impressed with their tolerating the get up...what good doggies! How cute!Our animals will never do that! Oh your guys are sooo beautiful!! I LOVE love love your holiday hats! I know Santa Paws is going to visit your house this year! Oh my goodness, they look so darn cute. they are so adorable, gorgeous dogs..
Hi Misty! they are so lovely and beautiful with their hats on..love to hug and kiss.. So cute! What beautiful dogs you have!